Border, thinner border or no border? Thread: Border, thinner border or no border? A: No border just the binding which is the red print. I don't hate this option but it seems a little unfinished to me. B: Thinner border. The picture shows a 3.5"(unfinished) piece. I think this would be a decent compromise. Would a thinner border 2.5" finished look better? C: Thinner border with piping between the sashing and the border to give a little definition between the black cornerstones and the black border. If I can get more of the red print it would be the red, if not then I would pick up one of the colors either in the sashing or the red print; maybe a solid red or a rusty orange or and then the black border. I am open to other suggestions as well. Thanks! I like the idea of a 3.5" border, but wouldn't worry about piping. I like your quilt ... a nice way to showcase some different blocks, in the star centres!! While I like quilts without borders, I agree with you, that this is not one of those! Not knowing the sizes of your blocks and sashings ... nor the strip you have laying next to it, it's hard to know how your suggested measurements compare! So here's my suggestions .... quilt top, then a black border about 1-1/2 the width of the sashings, then a red flange, then another black border about 1-1/2 times the width of the first black border. Then bind in black. Very nice quilt. I think it needs the wider border. The thinner border seems out of proportion. 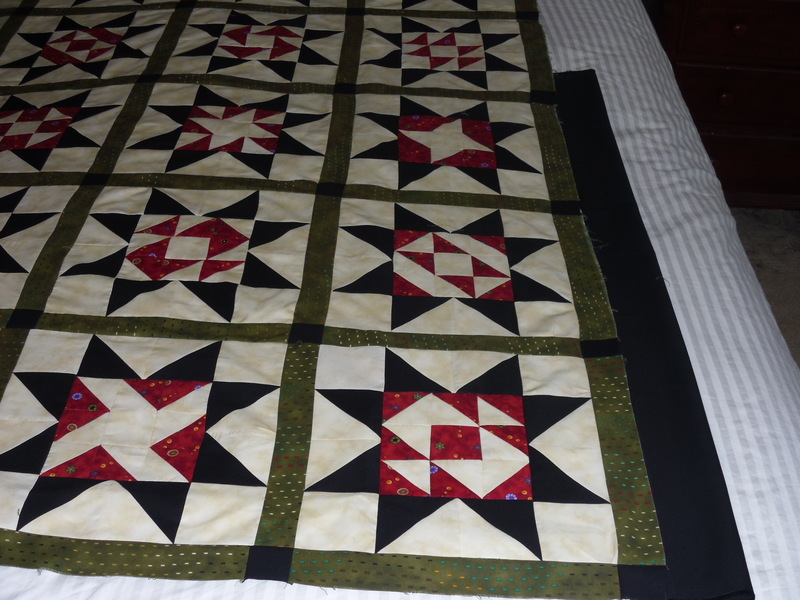 Since each block is large and the pattern is bold, the quilt would not be overwhelmed at all. Just my opinion. Interesting suggestion...going for two black borders and the red flange rather than the red binding. It might look cleaner with the black binding. I would do a 4" red border and bind it in black. But that is me. Thank you, both. I believe that a border is supposed to be 1/2 the size of the blocks and then sashing 1/3 the size? I'm pretty sure about the border, the sashing I'm a little vague on. But it seems correct because (this is a commercial pattern that I am using) and the original measurements (finished) are 12" block, 2"inch sashing and 6" border. My issue has come in because my blocks are not exactly 12" because I used too much steam and I had some shrinkage. You're right, though, Martina. The blocks are bold and it is for a man so it probably can handle the wider border. Maybe I'm just getting cold feet thinking about all of that black on black quilting that is going to be done in that wide border! Thanks! It's a look I like, and as you said, nice and clean. 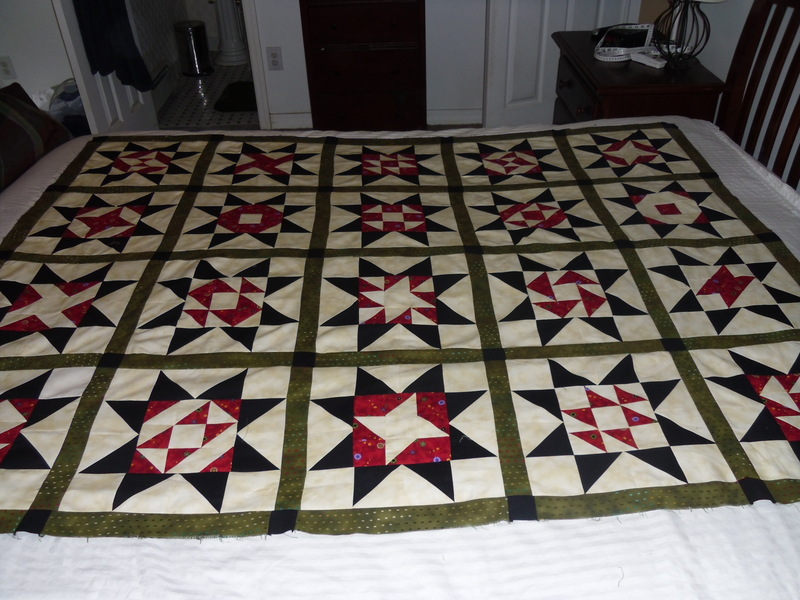 You've got a perfect quilt for it with the red in your stars, but not overpowering ... the flange will make it pop and too, won't be overpowering, either. LOL, that was what I wanted to do originally, the red border, especially since DH loves red, but they didn't have enough of the red so I had to compromise. I'd go with the thin black border with red piping. I think it would really frame the quilt nicely. I think I'd stick to the larger border as well. That said, since you don't have enough of the red to do the wider border, what about a combination of either the red/cream or the red/black to make up your 6.5" border and then bind in the red? Put the opposite color on the outside so that your binding stands out? Most times I like my bindings to either 'stand out' or tie in an under-used color in the body of the quilt so it ties everything together. That's just me, tho. Pretty quilt. I think that the main consideration should be the size that your DH needs for his quilt. If the quilt is already at that size, stop and don't worry about whether it "needs" borders. Lap/chair quilts are seldom seen all stretched out anyway. In my humble opinion, the quilt could be finished with a simple black or red binding and be done. If you feel the need to add a border, it needs to be twice the width of the sashing as a border serves as a frame for your artwork. I think a red or black would best suit the quilt, with binding the same color. Well I learned something else good on this Board! 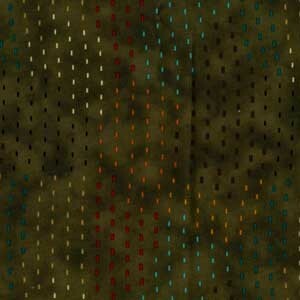 I never thought about proportions for borders in quilts but it makes perfect sense to me! Thank you for posting this!